Lawrence Weiner’s work, large-scale lines of text set in capital letters that create a pictorial and sculptural whole with the support, addresses the viewer directly. In their contributions art historians Nazli Gürlek and Rainer Metzger, both of whom have a long-term involvement with the impact of modern media as well as Weiner’s own output, examine his oeuvre, which has been consistently pursued for decades from differing perspectives. Equally importantly they also focus both on the concept behind the Kunsthaus Bregenz exhibition and the new piece of work that has been created especially for KUB. The catalogue, which is being designed in close collaboration with Lawrence Weiner, employs the medium to extend the work, authentically communicating not only his work’s typographic design but also the powerful manner in which it addresses the viewer. Edited by Thomas D. Trummer. Essays by Nazli Gürlek and Rainer Metzger. 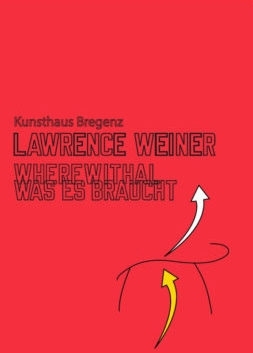 This title accompanies the exhibition Lawrence Weiner: Wherewithal | Was es Braucht, 12th November 2016 – 15th January 2017, Kunsthaus Bregenz, Austria.